In the second half of the 19th century the city began to spread to the north and east, so the building of residential areas was accompanied by the concept of creating green oases in those parts of the city. Since the spreading of the city to the north was limited by the existing bay (Valle del Ponte), during the Austro-Hungarian rule this part of the coast, so-called mandrač (tiny port), was filled up and reclaimed. Such an area was then used to design a park, which was to meet the needs of future residents. In close proximity of City Park (Gradski park), the first city hotel “Riviera” was built at the beginning of the 20th century, which is even today considered a true gem of Secession. 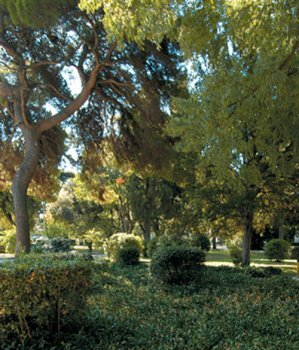 The park opposite the hotel was also called Riviera, and in 1918 both parks were named after the Italian Queen and called Parco Regina Elena. Villas Münz, with mostly prosperous residents, were already built next to the hotel, thus such a public garden in the surrounding area was simply a must. The then City Park (Gradski park), today’s Franz Joseph I Park is square, covering an area of just over 8,000 m2, whereas Riviera Park (today’s King Zvonimir’s Park) is trapezoid and nearly half the size. The long and snakelike paths in City Park led the strollers slowly from one side of the park to the other as if wishing to make their walks in this lovely park last longer. And when the gentry became tired, they would take a rest on the park benches and relax, accompanied by the sounds of the City Orchestra on a Sunday afternoon. 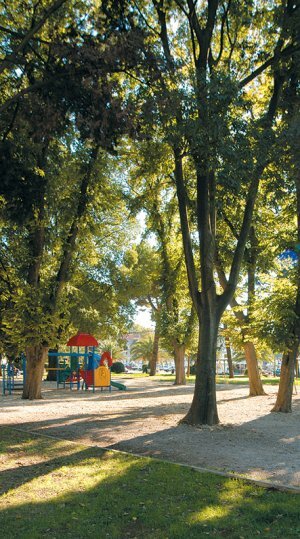 The magnificent line of hackberry trees that exists even today, separated these parks from the road, thus forming a pleasing visual curtain and at the same time protecting from unwanted noise and creating a cozy atmosphere. During the 1950s a fountain was built in the northern part of Franz Joseph I Park whose border was emphasized with natural Istrian pebbles, whereas the water sprang up from a heap of Istrian stone in the very center of the fountain. By building a modern children’s playground at the beginning of the 1990s, the central part of Franz Joseph I Park gradually expanded and became the main meeting place, as well as an ideal playground. Among the park’s exotic species specially interesting is Japanese plum yew (Cephalotaxus drupacea) which is originally found in Japan and China. It grows slowly, and bears a green stone-fruit resembling an olive. Among the autochthonous species in this park, magnificent specimens of elm, holm oak and hackberry tree stand out. The holm oak (Quercus ilex) is an autochthonous species of sub-Mediterranean Istrian woods and the most widespread oak species in this region. It is an evergreen, with a thick, dark crown and bark for which it was named (“crnika” in Croatian comes from the word “crn” meaning black). Its wood is of high quality and is widely used. It is also interesting to note that it sinks in water due to its density. One of the most represented deciduous species in the parks of Pula, as well as in Istrian woods along the coast, is the hackberry tree (Celtis australis) – (commonly known in Istria as “ladonja”; its name derives from the pleasant shade of the trees -“hlad” in Croatian). This species is especially popular among children because of the brown fruit with a chocolate-like flavor, so the tree is commonly known as “čokolatin”. 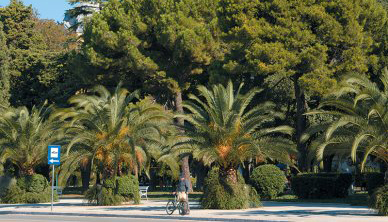 Along the edge of Franz Joseph I Park towards the waterfront (Riva) are impressive specimens of the Canary Island date palm (Phoenix canariensis) whose dense leafy crown attracts every visitor’s attention. The palm originates from the Canary Islands and was brought to Europe in the mid-18th century. It is almost impossible to leave Pula without noticing and taking a picture of the Arena under the magnificent crown of such palms.